NEWS FLASH! - POGO and Navy League Members Save the Marina!!! 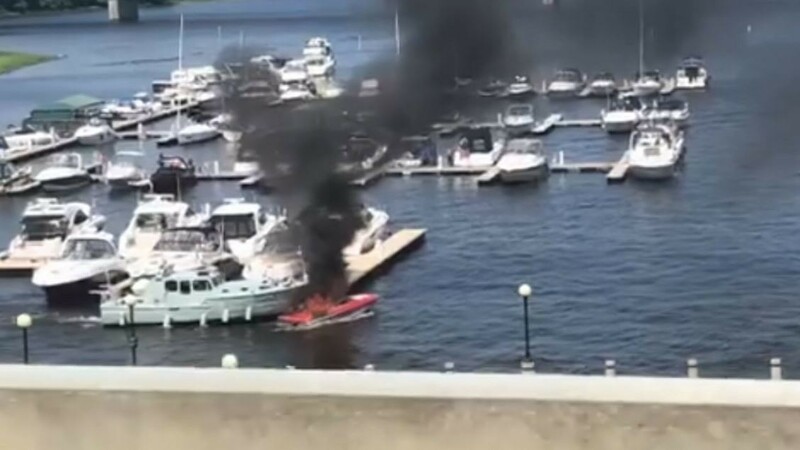 July 31, Jacques Drouin got to the marina just in time to see the smoke from a boat that had exploded, and the boat was drifting towards the marina with the wind. Usually, if one boat at a marina burns, everything catches fire and the whole marina goes up in flames. He grabbed two other Navy League members Dominic and Jessica, and the Pogo, our trusty old aluminum boat, and pushed the burning boat away from the marina with mere seconds to spare. This still is from a video taken from a car on the bridge. Click here to see the news report. It is in French, but it is very much worth watching for the video, even if you don't understand the French. NEWS FLASH - THE LANDING CRAFT HAVE LANDED!!! Four years of efforts have resulted in us receiving the two sister boats of the Pogo. 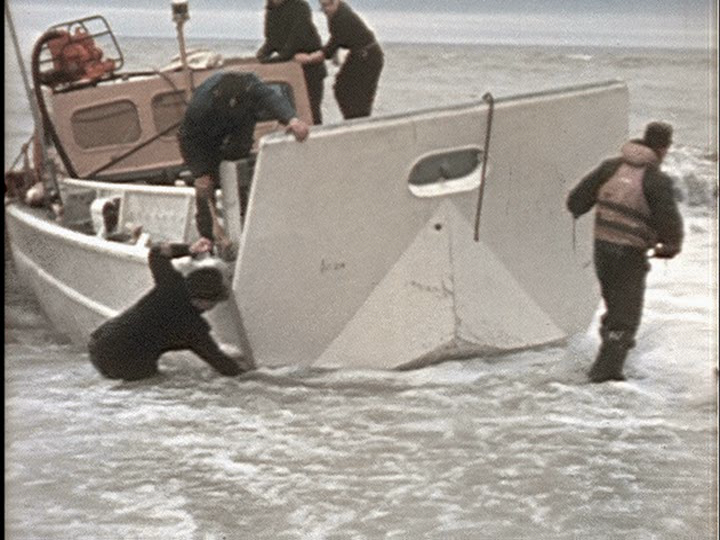 This is a photo from a documentary about the icegreaker, the HMS Labrador, and is one of the actual boats that we recently generously recieved from the Canadian military. Thus the three are together at long last. A page dedicated to these two landing craft will soon be added. Getting at least one of these boats up and running is our current priority. The Outaouais branch of the Navy League of Canada supports the Royal Canadian Sea Cadet Corp "La Hulloise" (RCSCC 230). This cadet corp offers a program to youth in partnership with the Navy League of Canada and the Department of National Defense. 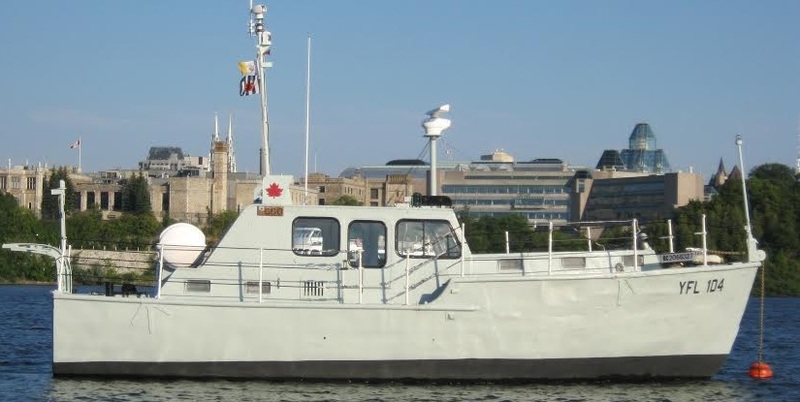 This sea cadet program takes place in a stimulating environment full of possibilities offering progressive chalanges to young people of the Gatineau region of the province Quebec. This program emphasizes the development of skills of civic responsibility and physical activity through the participation in various activities, largely supported by the Outaouais branch. Of the 267 branches across the country, the Outaouais Branch stands out because of its continuous service to the community since 1971, its involvement in local maritime affairs and its commitment to provide training boats for its youth. Our committee, called Affaires Maritimes, is unusual in Canada in that it was formed as a group specifically dedicated to the responsibilities of maintenance and financing of our boats. This was a trailblazing move to deal with the significant increase responsibility when we took the Pogo into our fleet in 2004. We are a multi-faceted team of people and boats consistantly working to preserve a piece of history whileproviding youth fantastic opportunities for training, experience and growth.